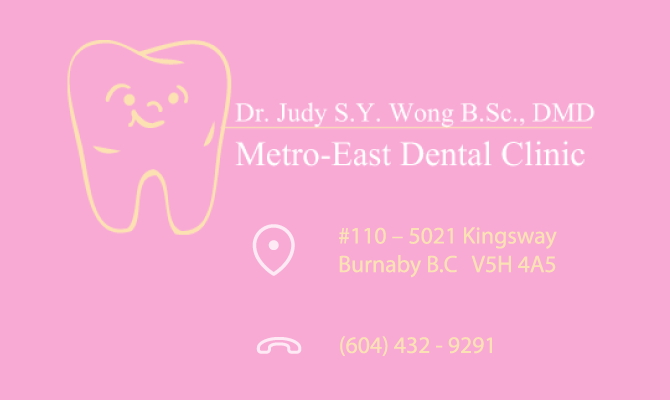 Here at Metro East Dental Clinic, Dr. Judy Wong is prepared to offer you the best dental service available. We offer a variety of services to ensure all dental needs are met. Some of these services include Fillings, Root Canal Therapy, Crowns and Bridges, Dentures, Prosthodontics, Pediatric Dentistry and various Cosmetic Dentistry Procedures. At Metro East Clinic, we want you to love every aspect of your smile, from aesthetic appearance to being confident in your general dental health.